Forward section completely broken apart; numerous pieces. Main part of the dash has one large crack. Ought to be a recall item. I have a 2004 Toyota Sienna with minor dash cracking problem. Toyota issued a recall several years ago and replaced all affected dash assemblies at no charge. This problem showed up about 7 years ago, but at the time I didn't have the money to fix it. Recently the dash has gotten so bad that is now falling in and I have holes in my dashboard and Dodge wants over 800 dollars to replace it and that doesn't include install. The cracked dash not only looks bad but it just keeps on cracking. When using the heater trash keeps blowing out. 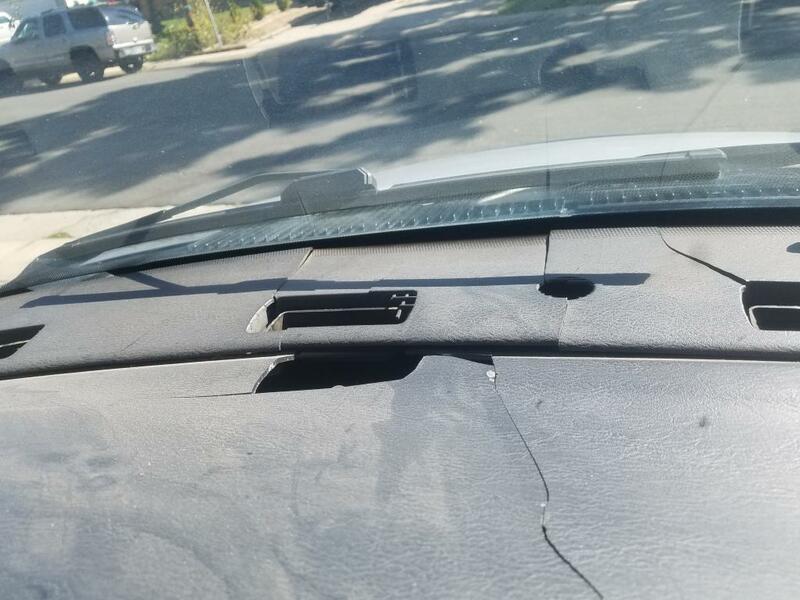 Dashboard starting to fall apart causing internal dashboard problems with AC wiring and mechanical issues along with flying sharp objects in a possible car crash. No other automaker has ever had such a serious condition and not corrected it. This is a very wide spread Dodge issue!!!!! THE INTERIOR COWL AS DODGE CALLS IT IS JUNK. Pieces fell into the heating and a/c system and clogged the blend doors. 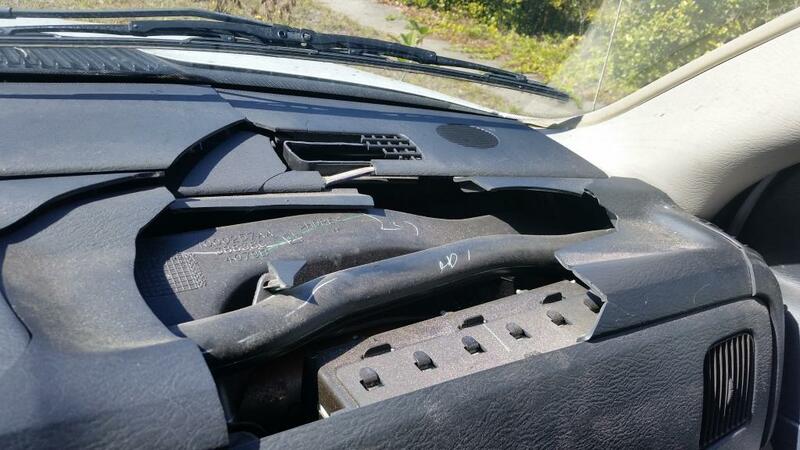 The entire dash and heater core box had to be removed to remove the broken pieces of plastic. Four hours labor just for removal of dash and box. NOT HAPPY WITH DODGE!!!!!!! This has been an excellent truck I bought in 2011 from a previous owner. The dash began to split in different places 3-4 years after I bought it. I have never had a vehicle do this before in my life. Very disappointed. This is unacceptable. I want this fixed. I have never had dashboards broken in all the cars and truck I have owned. This is about the worst customer service of any product sold in the USA. Dodge will tell you their products are better than the competition. That is just fine, but when there is a flaw in the product accept the responsibility for replacement. That is what a good company would do. 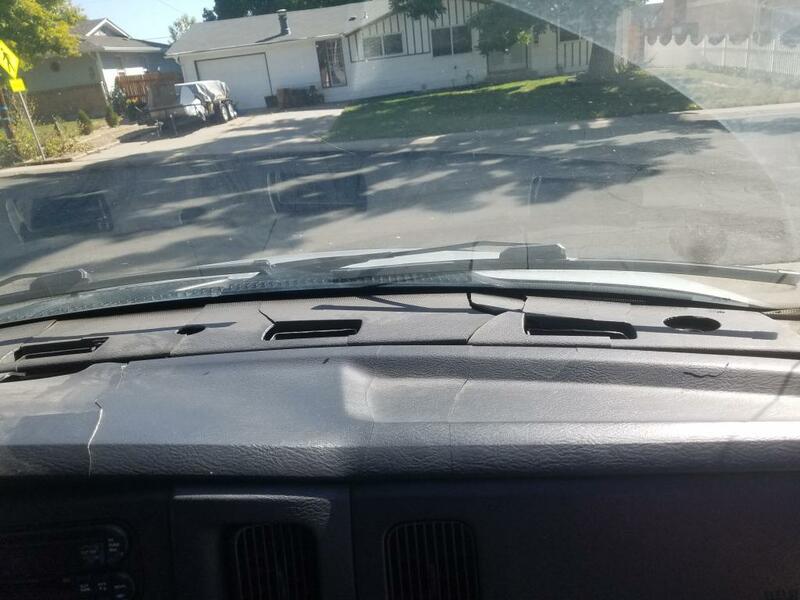 I just know if there is an accident with my truck and a piece of that dash becomes lodged in me there will be a lawsuit because there is enough data to show neglect on the part of dodge. 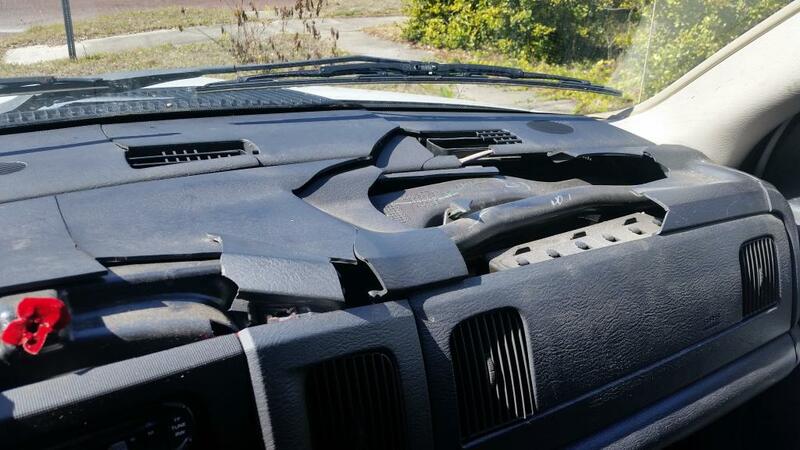 Bought my 2002 Dodge Truck brand new around 2005 my dashboard started falling apart. 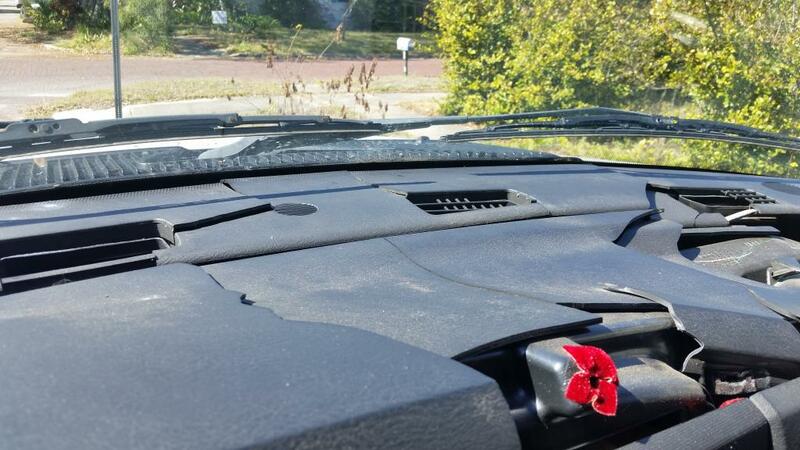 the truck has always been taken care of and covered from the sun. Dashboard is in complete pieces. THE DASH IS FALLING APART. EVERY DAY PIECES BREAK OFF. HAVE A COVER OVER IT RIGHT NOW SO IT LOOKS COSMETICALLY BETTER. THE HEATER CORE NEEDS TO BE REPLACED AND I'M SCARED THAT THE DASH WILL COMPLETELY DISINTEGRATE WHEN I REMOVE IT TO REPLACE THE CORE. HELP!!! The dash started cracking shortly after I bought the truck in 2009. Within a short time the dash was getting really bad so I used gorilla glue on it and put a dash cover on it. I have had to replace the center bezel 3 times because it started breaking and falling apart, causing sharp edges and flying debris. I took it to the dealer and had it inspected. (Please see attachment.). they need to fix their screw up. can't find a single good dash anywhere. if you order a new one its around $800. 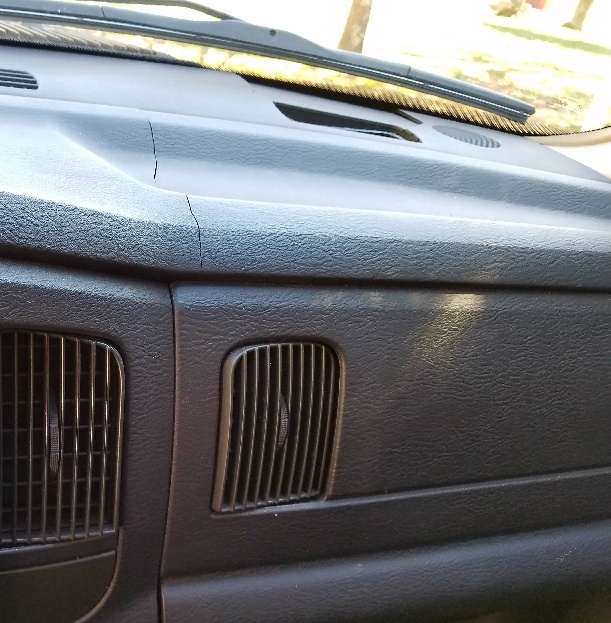 The speakers in the dash blew when plastic debris from the cracked dash got into them. 2002 Dodge Ram with a dash falling apart. Come on Dodge, own up to this. There are to0 many of these out there to shrug off. It is pitiful the amount of these trucks that have this problem. I run a garage and I have seen plenty. Shameful. I'm not the original owner. 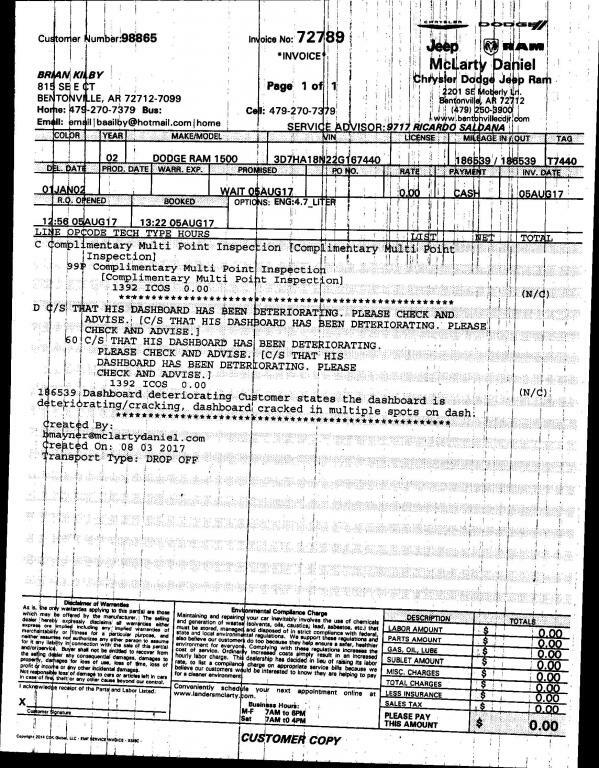 The problem was first noticed by the original owner when the truck was approximately 5 years old. The top dash is literally falling to pieces. Plastic chunks have been falling down into the vents, then flying out when the defrost blows. I'm always in fear of being hit in the eye by a flying shard of plastic! My mother's Toyota Avalon had a much less severely cracked dash, and Toyota recalled and replaced it. When will Dodge step up and do the right thing for its customers? It is absolutely ridiculous that the dash would have to be replaced just to repair the evaporator! Why would any company install anything made of plastic that would disintegrate from exposure to the Sun? Talk about not having any foresight?! I haven't even mentioned the potential safety issues of broken plastic flying around the cab causing human damage in an accident. Someone could lose an eye, or worse! This sight should remove all the foul language! Don't you have a better command of the English language than that? Your point can be made much better if you use language correctly. It shows a real level of immaturity. I'm hoping if this truck is ever in a crash the air bag does not turn the dash into plastic death stars like it think it would.